The River Thames is the lifeblood of London and has been instrumental in its establishment as a major trading centre. Over the centuries the city has expanded along this important waterway, making your ride along its banks a tour through the history of London's development. With your guide on hand to tell the city's story, begin your leisurely ride along the banks of the Thames. Cross the dominating Tower Bridge and take in the splendid views of the city from its elevated position above the river. Discover the beautiful covered market of Leadenhall and browse the exotic produce on offer in the Borough Market, both of which date back to the middle ages. Stop along the way to take pictures of London's most iconic buildings from the Big Ben to the London Eye as your guide tells you stories of their rich history. Sights you’ll see along the way include many of London’s top spots: St Paul’s Cathedral, the London Eye, Tower Bridge, Tower of London, Shakespeare’s Globe Theatre, London Bridge, Borough Market, Big Ben, Monument and Leadenhall Market. 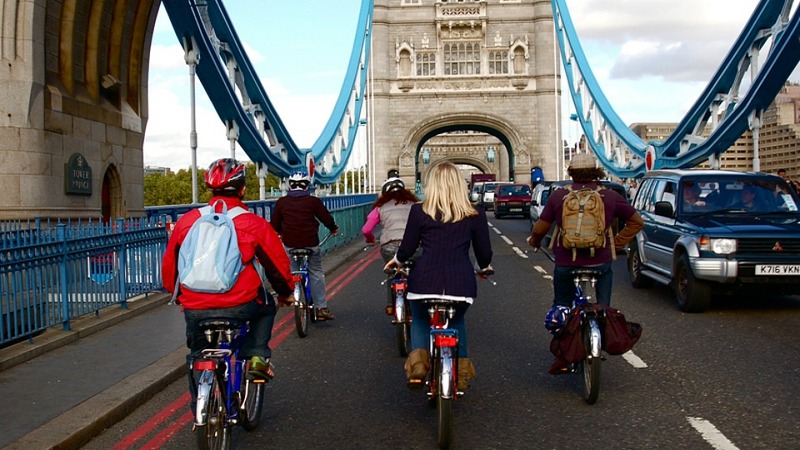 The River Thames Bike Tour includes more time on roads than the Royal London Bike Tour. The route is not intimidating or strenuous, but if you are not a confident cyclist we’d recommend choosing the Royal London Tour instead. Children are welcome to come along for the ride, but should be competent and confident on a bike. 100% refunds if the reservation is cancelled more than 72 hours (3 days) prior to the scheduled tour. No refunds for any reason once within 72 hours of the scheduled tour.